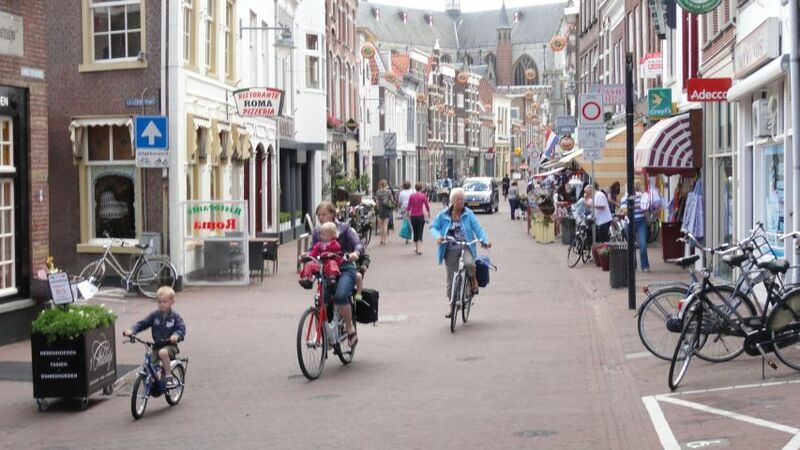 After two week-long cycling trips through Holland, separated by ten years, I'm hardly an expert on cycling there, but I do have a few observations that I'd like to pass on for anyone, like myself, who is a stranger to that country and plans a cycling trip there. Both of my cycling trips in Holland were in the middle of summer, and both times I ended up wearing jackets for warmth. In my recent trip the high temperature every day was about 70 degrees. This is a good cycling temperature, but it is cooler than you might expect for mid summer. Furthermore, you can confidently expect occasional rain during any given week. You will need rain gear, for sure. I never saw a bright, cloudless blue sky, but rather one with fleecy clouds. Often it reminded me of the skies in the Dutch master paintings, full of pleasant character. There is a reason Holland is known as a land of windmills. It's a very, very flat land with no impediments to a strong wind coming off the North Sea. In my first biking trip in Holland I had paid no attention to the wind in planning the trip, and I suffered accordingly. The prevailing wind is from the southwest, and is especially strong along the coast. Biking south along the coast, towards Belgium, can be really tough. On the other hand, if you're going north, you can sail along virtually without pedalling. If you have a choice in planning your itinerary, bike north along the coast and do any southward biking in the central parts of Holland. They speak Dutch, of course. But just about everyone there speaks English, and most of them speak it very well. We occasionally asked directions of people who didn't speak English, but that was much the exception, and virtually everyone at hotels and restaurants speaks English. However, there are a couple of exceptions here. We encountered a number of restaurants that did not have English menus. Much more important, though, is that road signs are not in English. Moreover, Dutch is, for most of us, an unfamiliar language, and it is much harder to guess what words mean than it is in French, German, Spanish, or Italian. 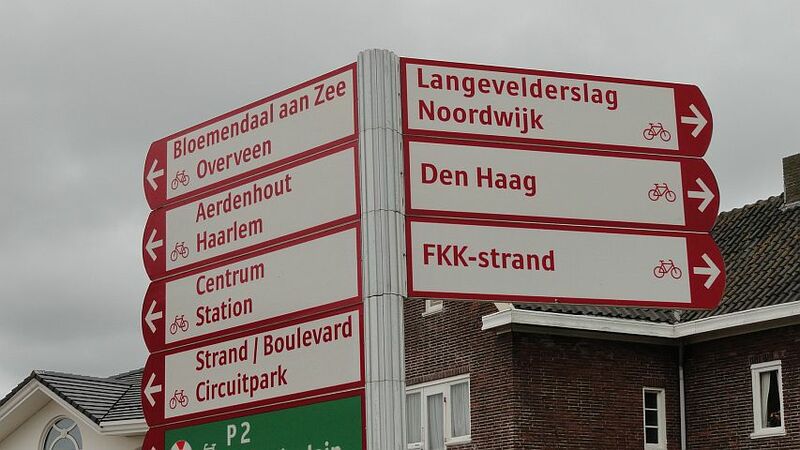 Who would think, for example, that "verkeer," means "detour?" 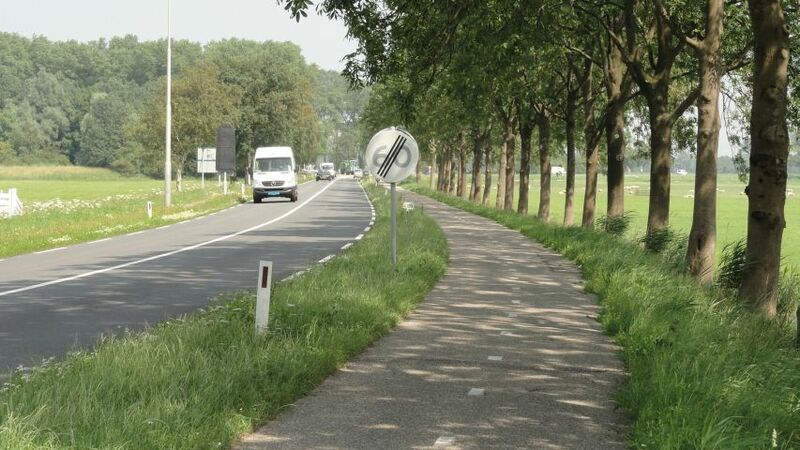 Thus I would recommend a little familiarization with common Dutch road signs. The country is awash in bikes. They are everywhere. I've never seen any other place so littered with bicycles. Here's a building that we passed in Amsterdam, just to give you an idea of what it's like. I don't know whether this is a school, a factory, a station, or what. Bikes in Holland are of a type almost unique to that country. I would describe them as "sturdy" in both the good and bad senses of this word. They are heavy, steel work horses with little pretense at finesse. Many of them have but a single gear. They have mud guards covering both back and front wheels, as well as guards over the sprocket and chain. By law, they are equipped with a bell and a headlight, which is usually powered by a generator running on the front wheel. Mostly they are just black, and many are rusted out. Nonetheless, each has a formidable chain and lock, as bicycle theft is said to be rampant. I keep thinking: who would want to steal these things? In spite of the heavy clumsiness of the typical Dutch bike, it really doesn't matter in a country without hills. Weight translates proportionally to friction, but that is a small factor relative to the wind resistance. Furthermore, you really don't need gears. Aside from the occasional ramp to an overpass, the roads are incredibly flat. The riding posture people adopt in Holland has been described as "sit up and beg," and though I'm not really sure what this means, everyone sits high and erect on their bikes. You don't see any of the underslung handlebars and leaned over posture that are common elsewhere. Moreover, no one wears a helmet. No one. However, you should. The exception to all these observations happens on dedicated bike paths on the weekends. There it seems that members of biking clubs practice for, or pretend to be in, races. Their bikes are sleek racing bikes, unequipped with the mandatory devices, and the riders are dressed in expensive cycling clothes and do in fact wear helmets. I suspect that on Monday mornings these same riders ride bareheaded on their heavy clunkers. 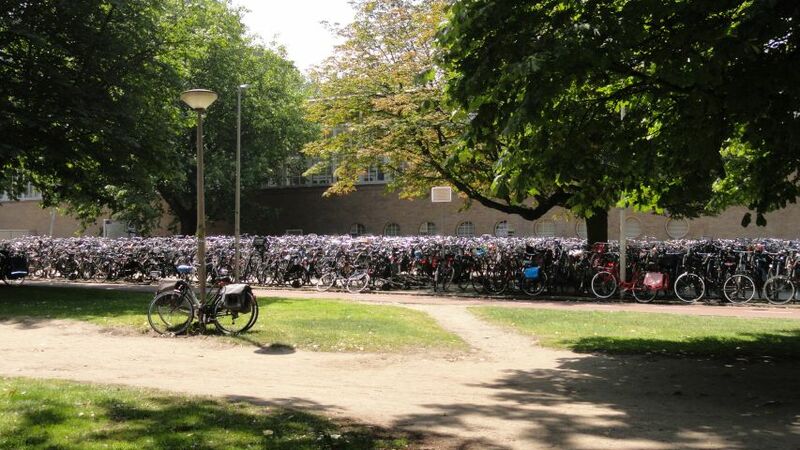 It is very easy to rent bikes in Holland. Though we worried about reserving bikes in the peak vacation times of summer, it was really quite unnecessary. The bike rental places we saw in Amsterdam were very busy and had big stocks of bikes going out and coming in constantly. I'd classify the roads in Holland into four categories -- the major thruways, national roads, secondary roads, and city roads. In addition, there are dedicated bike paths that do not have associated roads. Regardless of what roads and paths that you take, it seems that the miles go further in Holland than in many other places. The country itself is small and compressed. Towns and everything else are squeezed closer together, and you will find that you may cycle fewer miles to enjoy the trip. These are high speed, separated lane thruways, and you're not allowed to cycle on them. They don't have bike lanes, and you'd be crazy to try cycling there. There is one thing about these A roads that as a cyclist you do have to worry about, and that is crossing them. Obviously, when another road crosses an A road it must have an underpass or overpass to do so. In either case, the width of the crossing road is sometimes constricted and the bike lane on it disappears. We encountered this phenomenon several times, and it was always a puzzlement, as we had to find some alternative path in order to cross the major highway. In my experience, every N road had a bike path alongside. These are your best bets for quickest bike travel between towns and cities in Holland. However, I also discovered that sometimes on an N road the bike path would disappear occasionally. Usually, signs will direct you to an alternative, but not always. Sometimes N roads will be separated highways, and sometimes they just have two lanes, as in the photo above. The bike path may be a two-way path on one side of the road, or there may be bike paths on both sides of the highway. In any event, it is always easy cycling. If a highway between town or cities isn't an A-road or an N-road, I'll assume it's a secondary road. Again, in my limited experience, these roads are relatively narrow and often do not have accompanying bike paths. Two cars have barely room to pass, but the good news is that they are relatively free of traffic and can be quite delightful to cycle. The only uncomfortable situation is when cars drive by at high speeds or in the very unusual occurrence when two cars are passing each other right where the cyclist is, and there isn't room for all three of you. Hopefully, one of the cars waits on the other. Hopefully. In cities and towns some of the streets have cycle paths and some not. Nevertheless, there are cyclists everywhere. Often the streets are clogged with them, and between all the bikes, the traffic, and the parked cars, it is often quite a crowded scene. But as a cyclist you have so much company that it doesn't seem very dangerous. 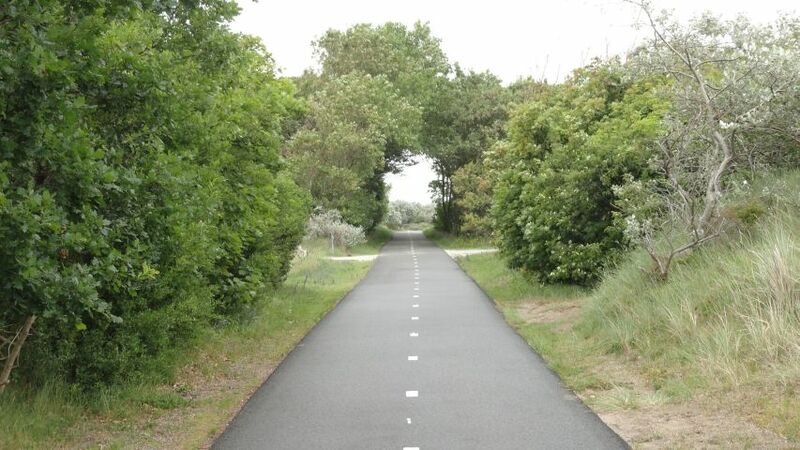 Holland is riddled with dedicated cycle paths that you won't find indicated on ordinary maps. Some are long distance, like path LF1 that runs the length of the Holland coast down into Belgium. At the VVV tourist stores in every sizeable town there are special cycling maps that indicate these dedicated bike paths. Also, for some long distance paths there are booklets that detail the entire path. Unfortunately, these latter booklets are in Dutch, but nonetheless the maps they contain are quite useful. 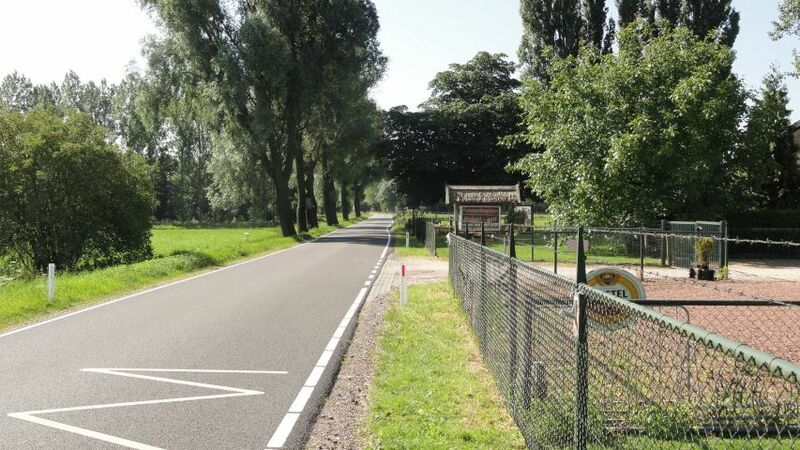 The cycle paths (fietspads in Dutch) are delightful to ride, but I always found that after some hours of such paths I longed for an ordinary road that would pass by and through the many small towns that make Holland what it is. Road signs are good, but not great. Just when you need them, they don't seem to be there. The names of streets, particularly in the cities and towns are sometimes hard to find. Instead of special poles with signs, they may be (as is often customary in Europe) found on the sides of buildings. Or not at all. Another problem that we encountered quite a few times was that the name of the street didn't correspond to the name given on our Michelin map or on our GPS. 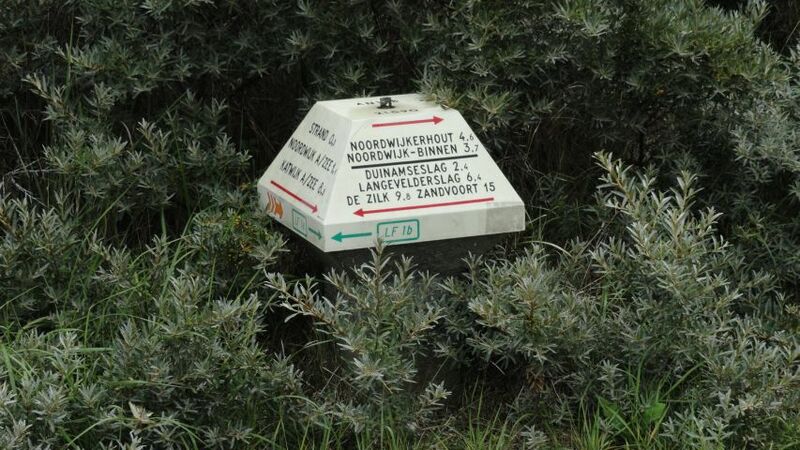 On the Michelin map and the Garmin GPS the highway would be listed as "N236", whereas the only signs on the highway said "Utrechtsweg." 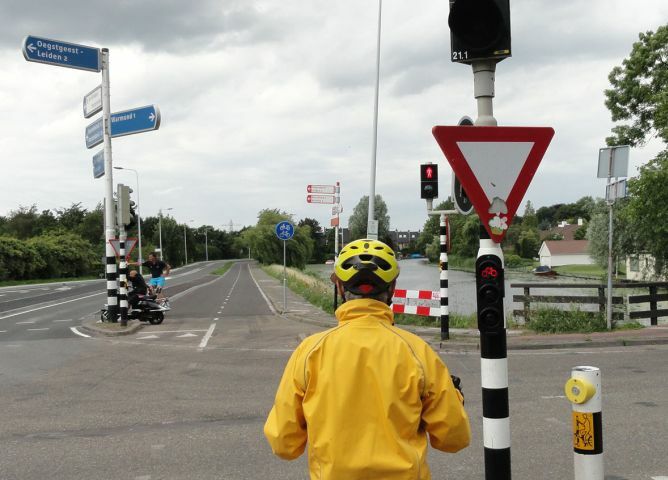 The bike paths often have their own traffic lights. You push a button to wait for the "bike" icon to turn green. Usually there will also be an icon for pedestrians, and it turns green at a different time than the bike icon. I often found myself watching and following the pedestrian light. Even when I caught myself doing this, I thought: Well, if walkers can cross, why not cyclists? Notice in the picture above that the pedestrian light is across the street, whereas the bike light is adjacent to the cyclist. Notice too that there are red signs that direct cyclists and blue signs that direct motorists to thruways. You can't see it very well in this picture, but across the street is a sign with a circle containing a bike icon on top of a motorbike icon, indicating that the path may be shared with motorbikes. In fact, during our last trip motorbikes were a bit of a nuisance. Often they went at high speed and surprised us as they passed. Dedicated cycle paths sometimes have unique signs, called mushroom signs (because they look like mushrooms, obviously). Here is one from the path LF1. They are really nice, but there aren't many of them, and often I found that bike paths are not well marked at all.